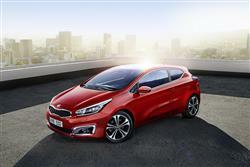 Find out everything you need to know on the new Kia Pro Ceed from independent vehicle review website Car And Driving. You can watch the video review to the left to see more of the car or read their written review below to get a true insight from an expert in the automotive industry. The improved Kia pro_cee'd coupe offers strong build quality, good looks and the option of a pokey yet efficient 1.0-litre turbo petrol engine. Never fancied a Kia? That might well change. Jonathan Crouch reports. Forget what you thought you knew about Kia. For years now, we've seen them as plucky triers, patted them on the head with patronising comments along the lines of 'a lot of metal for your money' or 'this is a company that's getting there fast'. Well, it's here now, in the big leagues and this improved pro_cee'd three door model is priced accordingly, right up there with the mainstream contenders like Vauxhall and Citroen. This brings with it some harsher judging criteria. The sort of gauche interior design and off-pace emissions that we used to forgive Kia for just won't wash now. In fact, expectations have been raised so high that the pro_cee'd is now a vehicle that needs to be excellent in order to achieve any sort of recognition. The first pro_ceed model in arrived in 2008 and the second in 2011, so it's clear that this is a car that's had a lot of budget thrown at it. Here, we're looking at the facelifted second generation version, a hugely important car for Kia, not just in terms of sales, it's also charged with raising the image of the brand. First impression suggest that it's right on the money. The pro_cee'd's underpinnings won't come as any great surprise. They're basically the same as the cee'd hatchback that has established itself well. Under the bonnet, as with that car, the key news here is the introduction of Kia's latest 1.0-litre T-GDI turbo petrol direct injection engine, offered in 98bhp and 118bhp outputs. We can't really see much point in opting for the pokier version as its pulling power - 171Nm of torque - is no better than that of the base unit. Either way, if you want a petrol engine in your cee'd, this powerplant offers a far more satisfying choice than the old 98bhp 1.4-litre petrol unit that's still offered on lower-order variants of this second generation model. At the top of the range, the 201bhp pro_cee'd GT model continues with a 1.6-litre petrol turbo unit that powers it to 62mph in just 7.4s. This variant now gets bigger brakes and a sound symposer to emphasis the engine note. Most pro_cee'd buyers though, want a diesel. There's an old-tech 89bhp 1.4-litre CRDi variant still available, but most buyers will want the more efficient, higher-tech 1.6-litre CRDi unit, offered with 134bhp. This gives buyers the option of a 7-speed dual-clutch DCT automatic transmission, one of those clever gearboxes able to seamlessly select the next gear before you've even left the last one. For this diesel variant, improvements in refinement have been prioritised, so additional sound-absorbing materials have been adopted for the carpet and ventilation system, while twice as much anti-vibration foam has been added to the dashboard panel to cut engine vibrations intruding on the calm of the cabin. Otherwise, things are much as before. So the driving dynamics still won't satisfy those for who see handling response as everything, despite the addition of a torque vectoring system, which reduces understeer by partially applying the brake to the inner wheel under cornering. You still get a supple multi-link rear suspension system, something that's still not the norm in this segment. And there's neat FlexSteer steering that allows you to alter feedback at the helm. Plus these models are as rapid as most owners will need them to be, the 134bhp diesel 1.6 making sixty two mph from rest in 9.5s on the way to 117mph. The pro_cee'd remains a handsome, wedge-shaped three-door hatch, designed by Europeans for Europeans. Built in Slovenia under the auspices of the Frankfurt-based Kia Motors Europe design team, it features a longer and lower profile than the five-door car, resulting in an edgy, coupe-like shape. A sharply raised beltline and a sharp crease leading into the rear arches disguise the fact that it rides on the same chassis as the cee'd and features the same windscreen angle. Other than that, only the bonnet and front wings are interchangeable parts. At the front, this revised version retains Kia's hallmark 'tiger-nose' grille, along with wraparound headlamps and integrated fog lamps. Changes include a more angular and wider bumper, with chrome trim around the fog lamps, and a smarter oval-shaped grille mesh echoing many of the shapes and design forms on the front of the car. A similar change has been made to the rear of the pro_cee'd, with reshaped bumpers, sporty-looking reflectors and LED lamps all featuring. Inside, the fascia layout remains neat, though there are still rather a lot of buttons. The asymmetric, driver-focused dashboard looks classier now though, receiving flashes of chrome around the instrument binnacle, the air vents and around the upper edge of the instrument panel. The central fascia panel is now finished in a high quality, anti-scratch gloss black for a more premium look. Other chrome highlights have also been added to the cabin, in particular around the base of the gear-stick, on door handles, and to the temperature control dials on the dashboard, depending on trim level. There's also an optional colour pack to make the cabin feel more individual. Out back, as before, there's a 380-litre boot. Push forward the split-folding rear bench and you can free up a useful 1,225-litres of total fresh air. Prices are much as before, so you'e looking at figures that start from around £15,000 and rise to around £23,000. There's not too much to instantly differentiate the S and SE models, although the eagle-eyed will spot that the S rides on 16-inch alloys whereas the SE is supplied with 17-inch rims. Standard convenience features on the S include automatic lights with 'welcome' and 'follow-me-home' functionality, 'one touch' electric windows, electrically-operated, heated and folding door mirrors with integrated LED side repeaters, cruise control with a speed limiter and steering wheel-mounted controls. Reversing sensors and a trip computer are also standard. Go for the SE and apart from the wheels, you'll also receive exterior door handle illumination, stainless steel door sill plates and pedals, power lumbar seat support for both driver and passenger, automatic dual-zone climate control and automatic rain-sensing wipers with a built-in de-icer function. The SE also gets a 7-inch touch screen European-wide satellite navigation system with full UK postcode functionality. This screen also doubles up to display the images from the colour reversing camera when the vehicle is in reverse. Plus there's an automatically-dimming rear view mirror and a keyless smart entry system with start/stop ignition button. You can see why Kia needed to develop this improved pro_cee'd model's 1.0 T-GDI petrol engine. After all, the returns of the older 1.4 and 1.6-litre petrol units it effectively replaces were hardly very noteworthy, even when fitted with the brand's Idle Stop/Go package. In contrast, the more modern 1.0-litre turbo unit can deliver 57.6mpg on the combined cycle, whichever tune you order it in. The CO2 return is 113g/km for the 98bhp version and 115g/km for the 118bhp model. Choose the 134bhp 1.6 CRDi diesel and you should manage 74.3mpg and 99g/km. As for the twin-clutch DCT automatic gearbox optionally offered to 1.6-litre diesel cee'd buyers, well Volkswagen has already proved that if this technology is done right, the result can actually be an improvement of fuel and CO2 figures over the equivalent manual models. That's not the case here though, where they take a dip of over 10%. That means 67.3mpg on the combined cycle and 109g/km. This improved Kia pro_cee'd seems to be the real deal. It's reasonably priced, extremely well equipped, it looks great and it's solidly built with an unbeatable after sales package. What more do you want? More power? More speed? Kia will even serve that up with a turbocharged 204PS pro_cee'd GT model as well, should you so desire. It's tough to see a weak link with this model. No, it won't be as light on its feet as a Renault Megane Coupe through a set of bends but the flipside of this is that the car feels as if it'll still be going strong when the Megane is being parted out in a breaker's yard. The car this pro_cee'd most closely squares up to is Vauxhall's three-door Astra. There's a similar impression of solidity here and no small commonality in their good looks. Pricing isn't too far off beam either. Which would we choose? If pressed, we might well throw our lot in with Kia. Both cars have a lot to commend them. As an ownership proposition the pro_cee'd probably edges it. Job done.